“What does it mean to wear your heart on your sleeve?” Lina Tullgren questions on “Red Dawn” from her debut album Won. So much of the album is the New England singer-songwriter sorting out a variety of feelings into catchy, textured songs. 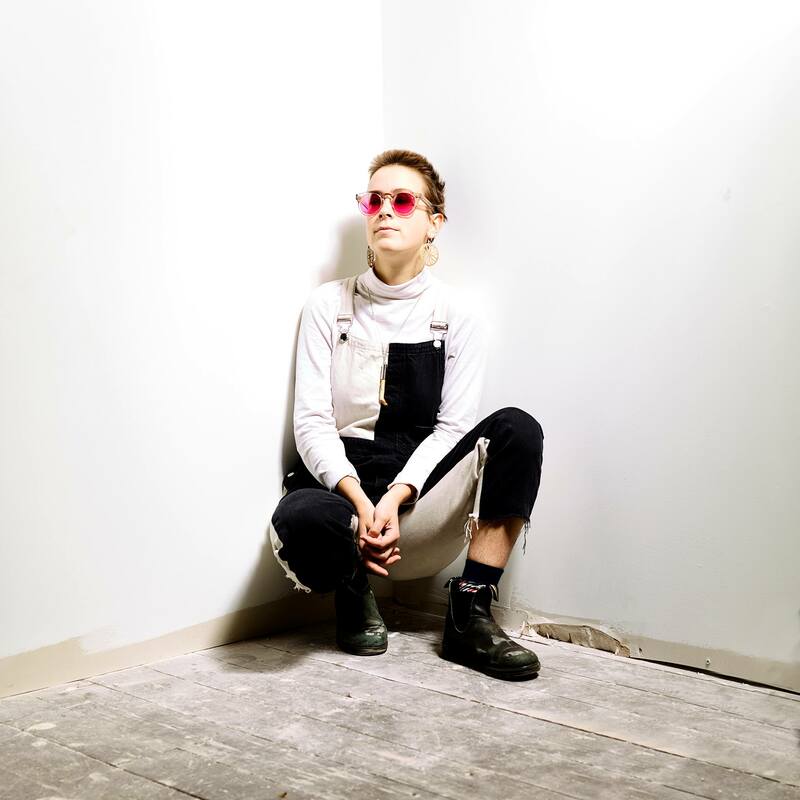 Atwood Magazine recently got to sit down with Tullgren to talk about her songwriting process, sense of home, and ectoplasm photography. Won is out this Friday, September 22. Atwood Magazine: What makes you gravitate more towards the electric guitar as opposed to the acoustic? Lina Tullgren: It’s more fun. For me, I was only playing acoustic instruments for the first 13 years of my life. Having that shift-that stark, intense shift-was important for me at the time, and I certainly gravitated towards something that was incredibly different and louder than the other thing that I’d been doing for so many years before. This album is more of a full band effort than Wishlist. How do you feel that adding more instrumentation expanded your sound? Lina: It was always my intention to have a full band. It was never a gradual process in my mind with the writing. The full band intention was always there from the minute I started the project. It just wasn’t really able to come to fruition until making this record, mostly due to these songs became a little louder, a little more ready to lend themselves to those kinds of instrumentation. Whereas Wishlist, we tried to add things to it, and the songs themselves were a little too raw, stood too much on their own that they didn’t really need those other factors around them. Sorry, what was the question again? How do you feel that adding the instrumentation expanded the sound? Lina: I had these ideas in my head of what I wanted it to sound like, and now that’s what it sounds like. It’s a natural thing for me, like, “Well, this is what I want it to be, and we’re gonna make that happen.” I never really wanted the music to come across as this soft singer-songwriter camp, which it easily fell into. Not that that’s a bad thing, but that’s not necessarily how I want my music to be represented. I think that it’s a bit bigger, more vast than that. I think having the full band communicates those ideas better. Wishlist was recorded on analog, right? Was Won recorded on analog? Okay, why do you prefer recording on analog over digital? Lina: That’s just what we’ve always had. It’s the machine that I have. We’ve just always recorded on tape, because we’ve always had tape machines around. I think the whole “Oh we’re gonna record on tape for that warm tape, tube sound!” is a little silly and overwrought. Yeah, it sounds great. There’s a very special hum and fuzz that is sort of its own instrument in all of the songs that you might hear, which is the hum of the tape. Which is nice, it’s very soft and comforting. That’s just what we’ve always done since we were in high school. SO we figure we’ll keep doing it until we get sick of it. Recording with tapes helps you limit yourself a bit. Usually, there are only so many takes you can do on each thing, and there are only so many tracks that you can use. For example, if I bring an idea to the table like “I want to add three more vocals to this, and I want to add a trombone.” Well, we don’t really have the physical space on an eight track. Instead of doing those things that we can’t do, we have to figure out ways to get creative to replicate those ideas in a different way. Do you see yourself going digital so you can add things like trombone or layer a bunch of instruments in the future? Lina: Yeah, maybe. Maybe for this next record. I’ve been really into brass instruments lately. It depends how recording the next album goes. I have certainly some ideas for big, rich strings and other instruments, but I’m not sure if these new songs will lend themselves to them, but we’ll see. My favorite song from Won was “Red Dawn.” Can you talk us through your writing process for that song in particular and then your writing process in general? Lina: Well, the writing process of that song was very similar to the writing process of most of the other songs, which is me playing guitar for a long time, and finding some sort of progression that I enjoy and looping that. The lyrics come after that very quickly. It’s not necessarily a very conscious process. It’s usually like I know that I feel weird about something, and there’s definitely something going on in my own head, but I don’t always know necessarily how to identify it. Then, I sit down to play guitar and begin to write and those things will emerge and show themselves to me. So is your lyric writing process, trying to write a melody then finding words to go with it? Lina: Yeah, that’s more or less [it]. Guitar thing comes first, and then, the lyrics come after that. It’s usually quite natural-not me sitting down and being like “I’m going to write about this thing, today. I’m going to write about this other thing!” It’s an unconscious stream of consciousness. Why did you call the album Won? Lina: Most of these songs are me working through things and triumphs over anxiety and anger and love, which I didn’t win. Nobody does. I see this record as I put these things out there. I’ve tried my best in the situations that they touch on. I don’t always win, but sometimes I do, and with this record, I think I did. I thought the artwork was awesome, especially after reading about your choice to re-create ectoplasm photography. I read that you liked the idea of expelling something negative from yourself, but there’s also a paranormal, spooky aspect to ectoplasm photography. Did that play an influence in that? Lina: I think the con-artistry of ectoplasm photography plays more of an influence in it for me. Certainly the paranormal side is very interesting, but what I found more fascinating is that all these ectoplasm photographers were con-artists. They took these photographs and double exposed all these photographs so that it looked like there were these photos in the ectoplasm. When people got their photos back, they thought they were expelling these bad spirits that came in the form of these faces. I thought that was interesting in that artists and musicians are also con-artists in some ways. In the way that we are putting so much of ourselves out there on the line, but none of these people really know us at all or know who we are, which is a spooky divide sometimes. Was that your reason in choosing that for the album artwork? Lina: No, I just became obsessed with ectoplasm photography. Me and my guitarist, Tye, were playing a show in Portland, Maine, and we had gotten our aura photos taken that morning. Do you know about aura photography? It was definitely a cool image, and that’s you on the album cover right? I read in an interview that you were planning on moving to New York from New England. Lina: That’s untrue. I lived in New York for a little bit of last year. I lived there for 4 months last year. I’ve been back in Boston for all of 2017, but I’m moving back to Maine in a few weeks for a couple months. Then, I don’t know what’s going to happen after that. Did living in a bunch of different cities affect your writing process? Lina: A lot of the songs stem from looking for a place of belonging and a home to feel comfortable in. I’ve moved a bunch of times. I haven’t lived in a bunch of different cities, but I’ve moved and uprooted so many times. That sort of uprooting oneself never really gets any easier for me. It never fails to deeply affect me and my own psyche. A lot of the music does stem from those places of in-between-ness.